The Neon Neuron Blog: The Neon Neuron on Patreon! The Neon Neuron on Patreon! 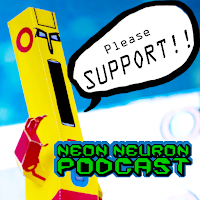 The Neon Neuron is now on Patreon! This is your humble custodian of all things in the Neuroniverse. I would just like to let you know that the Neon Neuron is now on Patreon. If you like what we are doing around these parts, you know, the podcast and the blog and the papercrafts... Then show your support by throwing some love our way! Every little bit is very much appreciated.